The NIV Gift Bible for Kids is the perfect gift for graduations, confirmations, and other special achievements. The bonus content explores the teachings, ministry, miracles, and parables of Jesus, as well as life in New Testament times, enhancing and enriching the reading of Scripture. 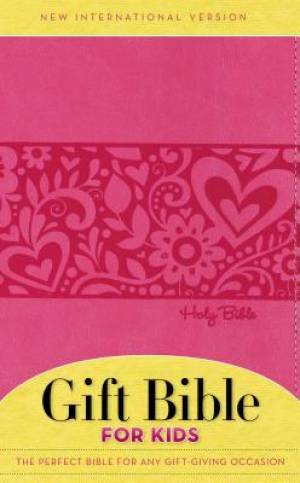 NIV, Gift Bible for Kids, Imitation Leather, Pink by Zondervan was published by Zonderkidz in February 2015 and is our 19155th best seller. The ISBN for NIV, Gift Bible for Kids, Imitation Leather, Pink is 9780310748458. Be the first to review NIV, Gift Bible for Kids, Imitation Leather, Pink! Got a question? No problem! Just click here to ask us about NIV, Gift Bible for Kids, Imitation Leather, Pink.